Enter digits in blank cells so that every row, every column and every 3x3 block contains all digits from 1 to 9. All puzzles on this site are created with our own computer program. 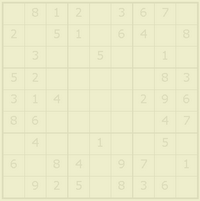 Every Sudoku has a unique solution and is solvable without guessing. For children and beginners we have smaller sizes like 4x4 or 6x6, but even skilled experts will be challenged by our hard and oversized ones. Every Sunday new Sudoku puzzles to print out or play online in assorted sizes and difficulties. Good luck! This Sudoku has been solved 57 times.